We’ve brought fantasy to life with the Fairytale Tree House – and added a touch of bespoke luxury. 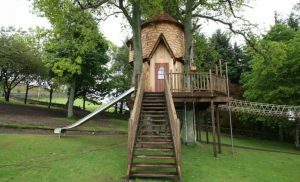 Located in a picturesque garden among the rolling hills of a Scottish estate, this two story tree house is an adventure play area rivalling even some real castles. It is finished with turreted roofs for both the main structure and side turret, visible as they peek through the leaves. When the kids aren’t exploring the turret or getting lost in their imaginations, they have a host of children’s play equipment to take advantage of. Like the rope bridge linking the raised decking that surrounds the castle to a secondary tree deck. An exciting zip wire runs from the tree deck across the lawn. 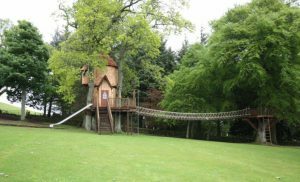 Besides the zip wire the kids can choose from the slide, fireman’s pole, rope ladder or (for the timid) the conventional wood stairs. There is even a climbing wall to take advantage of! 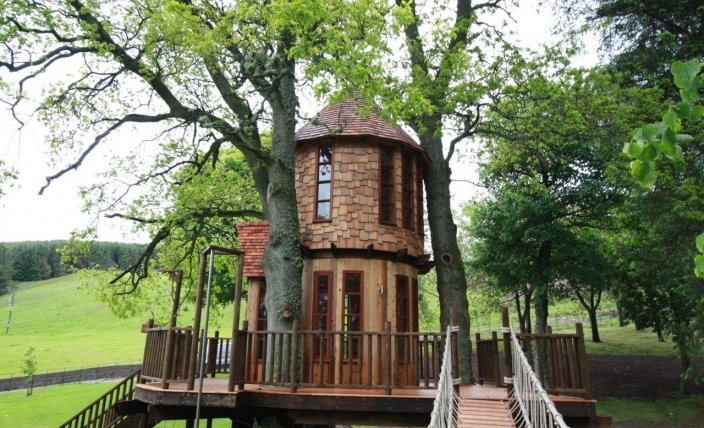 Whilst the play area offers exciting outdoor entertainment, the tree house features another secret to discover indoors. 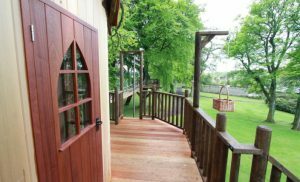 Beyond the charming dark red wood front door with its small, arched window, is a ladder which leads up to a secret trap door and into a brilliant upstairs hideaway. 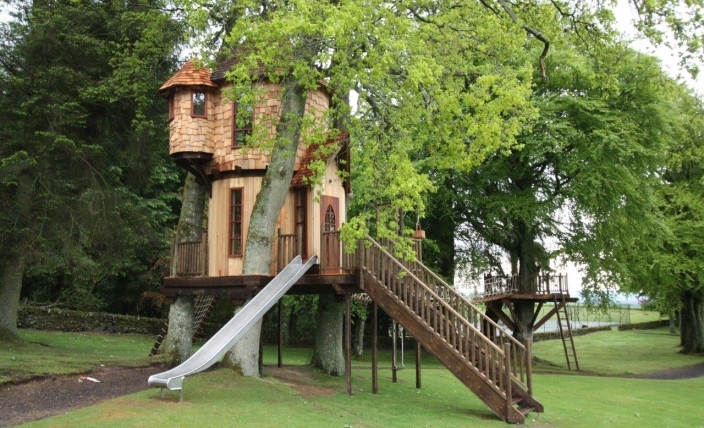 The perfect escape for small people to dream big. Hothorpe Hall, based on the border of rural Northamptonshire and Leicestershire, is a stately home full of history and prides itself on being an events centre experienced at hosting meetings, conferences, group breaks, church weekends, weddings and functions. 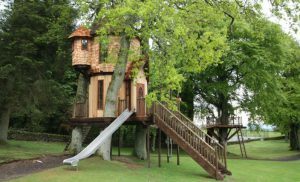 This tree house castle is built in the grounds of one of Irelands most magnificent country houses. Designed by Blue Forest in a Tudor Gothic style, the tree house closely resembles the architecture of the main house, which dates back to the 17th century.